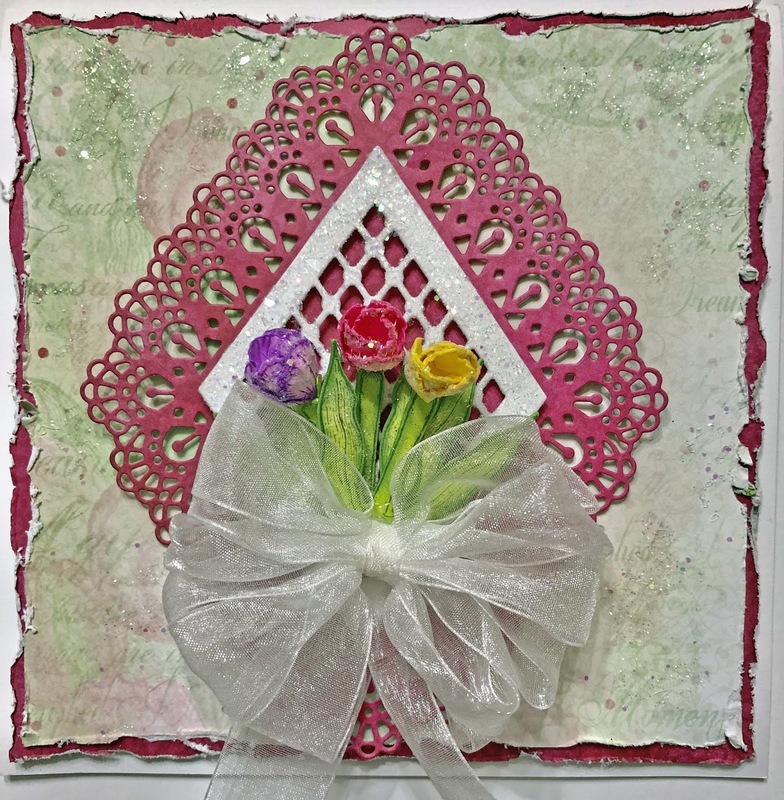 You're going to love the new Lacy Diamond Dies...there's so much creating you can do with them. Here's a card I'm calling Shabby Diamonds! Instructions: Card size is 6 x 6”. Score and fold 12 x 6” white cardstock at 6” on the long side to create a 6 x 6” tent fold card base. Cut magenta designer paper from the Tulip Time Collection to 5 3/4 x 5 3/4”, cut green designer paper from the Tulip Time Collection to 5 1/2 x 5 1/2”. Distress the edges of both and adhere together using dries clear adhesive. Adhere to the card base using dimensional tape. Cut another piece of the magenta designer paper 5 7/8 x 5 7/8”, lightly distress the edges and adhere to the inside of the card. Diecut the Lacy Diamond die from the magenta designer pager and adhere to the center of the card front using dimensional dots. 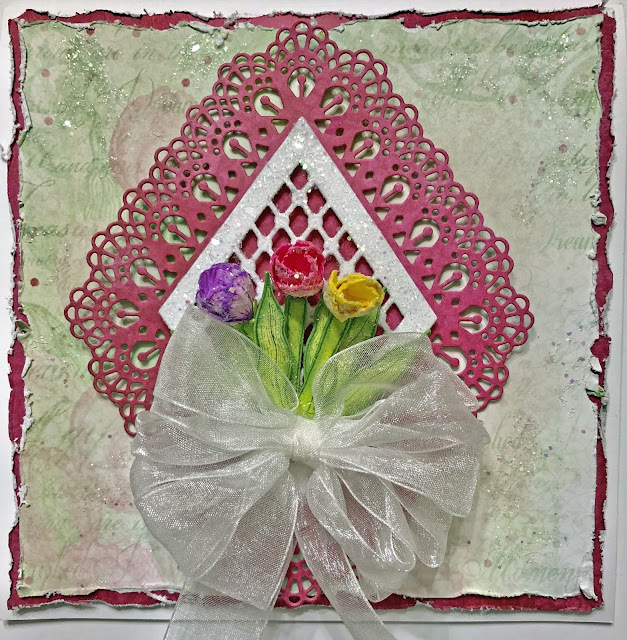 Using the third largest die from the Diamond Basics set, diecut the center of the Lacy Diamond die set from white cardstock. Sponge with dries clear adhesive, sprinkle with Rajni Chawla’s Crystal Clear glitter, let dry and then adhere to the center of the magenta lacy diamond using Darice foam strips. Stamp the smallest tulips on floral paper using Buttercup, Majestic Violet and Vibrant Fuchsia inks. Color with the same inks and diecut using the coordinating dies. Ink around the edges, color the backs of the petals and place in the tulip mold. Spritz with water and run through the diecutting machine. Press down in the middle of each petal using the stylus from the Deluxe Flower Shaping kit to further shape the flowers. Use two petals to create each flower making sure to offset them. Stamp the smallest leaves on floral paper using Ranger Olive ink, color using Leaf Green and Olive inks and diecut using the coordinating dies. Shape using the deluxe flower shaping kit. Adhere the flowers to the leaves, sponge with dries clear adhesive, sprinkle with Rajni Chawla’s Crystal Clear glitter and then adhere to the card base using a hot glue gun. 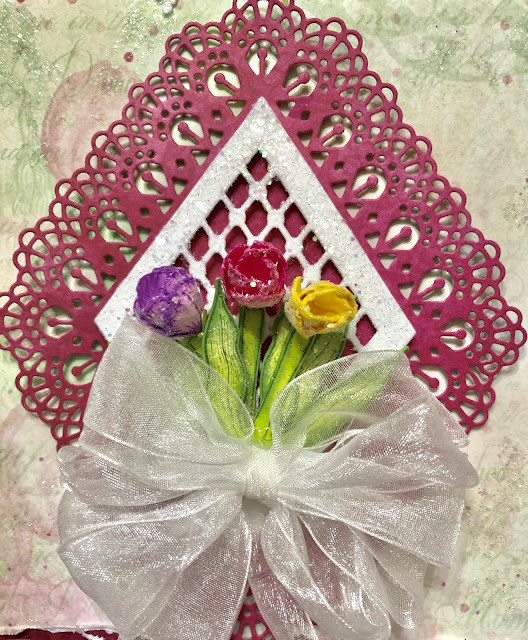 Tie a multi-loop bow using sheer white ribbon and adhere the card front as shown. Dab the card front randomly with dries clear adhesive and sprinkle with crystal clear glitter. 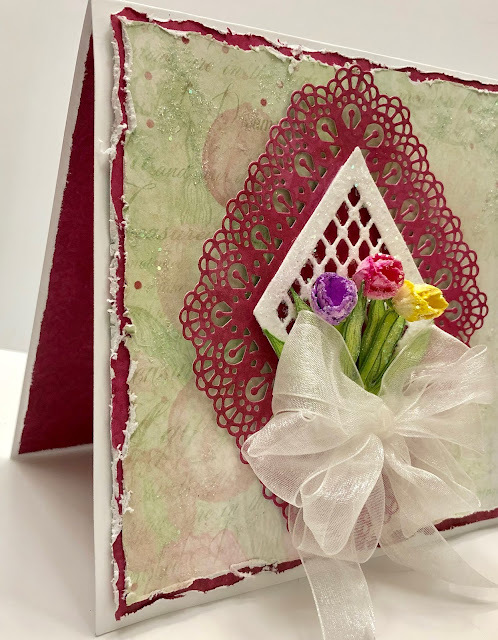 Be sure to visit the Heartfelt Creations Blog to see all of the gorgeous projects created with the new Lacy Diamond Dies by the fabulous Design Team. Thank you so much for stopping by...have a beautiful day!!! Beautiful Diamond card with a gorgeous bow!